People learn best through practice, not hours of boring lecture. Our two-day Certified Scrum Product Owner training is a highly interactive blend of theory and practice. Through inventive exercises and real-world stories, our students leave class ready to use Scrum to improve their work lives and their career paths. Whether you are new to agile practices or a seasoned professional, you'll leave this course with a practical, time-tested plan that you can begin using right away to enhance your agile transformation. 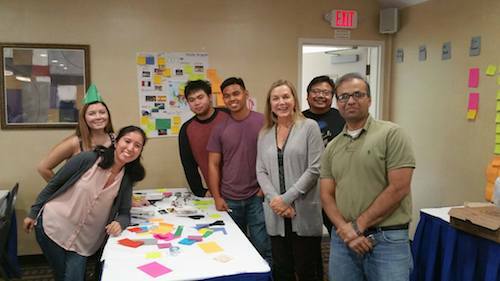 Our students (like the ones with Angela in the photo above in San Jose, CA) have gone on to become successful ScrumMasters, Product Owners, Scrum team members, and agile coaches. Isn’t it time to take your career to the next level by gaining the CSM certification? You will leave this course ready to use your new-found knowledge to start improving your project predictability and success rate right away! Angela Druckman is an agile coach and Certified Scrum Trainer. She specializes in Agile Transformation, helping teams and organizations all over the world improve their competitive position and effectiveness through agility. Whether working with tiny start-ups or Fortune 100 companies, Angela’s experience and guidance have helped her clients achieve extraordinary and measurable success with their agile practices. Angela is the author of 30 Days to Better Agile.